Matthew Dowling: How Do I Know if I'm a Christian? How Do I Know if I'm a Christian? Could there be any question more important? But you don’t hear a lot of people asking it these days. Some people think it’s unhelpful, unsettling and unnecessary to ask such a question. But if we are wrong on the matter of greatest personal concern to us – wouldn’t we want to know? Sometimes people think it’s just a case of believing the gospel and seek to convince struggling souls to do this. But you can believe these things to be true and still not be assured they apply to you. Perhaps we are also functioning at a low level of assurance. The truth is that we cannot expect to have high levels of assurance while we have low levels of obedience. The more we find the evidence of faith working by love in our lives and hearts, the more assurance we can enjoy. One book, in particular, has been of supreme help in this area: William Guthrie’s The Christian’s Great Interest. The subject of the book is assurance of salvation and it seeks to give various tests by which someone may know that he is a Christian and in doing so also sets out very clearly the way of salvation. “Great Interest” doesn’t just mean that the book deals with the matter of greatest importance to a Christian and his chief concern. It is a legal term and means to have a valid stake or share in something to our benefit. Guthrie’s book deals with how the Christian may know whether he has a valid legal claim. The claim that matters is one within the Will and Testament or Covenant that the Lord Jesus Christ graciously makes with His people. Guthrie helps us to put ourselves in a courtroom trial where we are under Scripture as a judge to determine if our claim is true. Guthrie opens the book with a concern that there are many “pretending, without ground, to a special interest in Christ”. On the other hand, many others “who have good ground of a claim to Christ are not established in the confidence of His favor, but remain in the dark without comfort, hesitating concerning the reality of godliness in themselves”. This state of affairs prompts two questions – 1. How can someone know if they are in Christ and whether or not he may lay genuine claim to God’s favor and salvation? 2. What should we do if we cannot find in ourselves the marks of a saving interest? Guthrie’s book was highly commended by John Owen. He said that it contained more theology than everything he himself had written. Thomas Chalmers said it was the best book he had ever read. It is important to be clear that assurance is possible, and more easily attained than many realize. It is of the utmost importance to be “savingly in covenant with God”. Scripture must be the rule by which we are able to judge whether or not this is so. Far too many are ignorant of the different ways in which God works. Others deal deceitfully with God and their own conscience in holding on to sin. There is also a lazy apathy that resists the effort of examining ourselves, but it is “a work and business which cannot be done sleeping”. Assurance must be labored after, it is not something that falls effortlessly into our laps. Many are ignorant concerning what evidence will satisfy the quest for assurance, despite the fact that it is clear in Scripture. Some are looking for entirely the wrong evidences, such as attaining sinlessness or continuous rapturous prayer. Many that are struggling to attain assurance can make the following mistakes: (a) they think that all who are in Christ know that they are; (b) they think that all who have assurance have the same degree of certainty; (c) they think that this persuasion should be continuous; (d) they think that a person must be able to answer every objection against their assurance. Others believe that they have sinned against the Holy Ghost and put themselves beyond pardon. Guthrie defines what this is (and what it is not) very carefully and helpfully from the Scriptures. Guthrie speaks of the different ways in which people are drawn to Christ. Some indeed may be drawn lovingly or called suddenly in a very direct way. The “ordinary” way involves being humbled by conviction during which the conscience is awakened till the soul is full of concern about salvation and driven from resting in anything of themselves to casting their all on Christ for salvation. This is carefully distinguished from the temporary convictions of those that fall away. The first evidence that Guthrie calls for in this trial is faith. Faith is vital in the matter of assurance – indeed all other marks are worthless without it. Yet it can be mistaken. It is not as difficult or mysterious as men sometimes think; the Scriptures speak of it as a simple trusting, resting, and looking. It can be found in various marks of submissive obedience and devotion to Christ. “If men but have an appetite, they have it; for they are blessed that hunger after righteousness”. Thus Guthrie identifies the marks of true faith but also distinguishes it from false faith. The second set of evidence called upon relates to the new birth. There is a total renewal when a man comes to saving faith in Christ. In mind, heart and will he is changed from being self-oriented and self-serving to serving and glorifying God. Attitudes to all aspects of life are renewed whether it is work or worship, relationships, recreation or eating and drinking. There is a respect to all of God’s commandments, submission to and valuing of Christ alone that hypocrites never have despite the outward similarities with believers that they may seem to possess. The great question in the minds of many, however, is why some believers doubt. Guthrie opens this up in considerable depth dealing with God’s sovereignty and our own responsibility in these matters. He speaks of twelve areas where different levels of experience may be enjoyed but where assurance may be obtained. Part Two of the book also proceeds to deal with the second question raised: What should we do if we cannot find in ourselves the marks of a saving interest? Many may believe that they have closed in with Christ in the gospel very few, however, really have. Yet there is a duty that lies on all under the terms of the Covenant of Grace as it is preached to all. There must be a “coming” on our part. “God excludes none if they do not exclude themselves”. “It is a coming on our part, and yet a drawing on His part”. What is it to close with God’s offer of salvation in the preached covenant? It means to recognize the full guilt of sin, our need for salvation and the impossibility of any salvation without God’s appointment in Christ. We must “quit and renounce all thoughts of help or salvation by our own righteousness”. Faith is humble though resolute, hearty rather than mere mental assent though it must depend upon knowledge. The Covenanters and Puritans found great benefit in personal covenanting with God. Usually, this involved explicitly accepting of Christ and confessing sin and expressing satisfaction with the gospel way of salvation. The covenant was often renewed at Communion seasons and times of difficulty or desertion. Guthrie counsels those who lack assurance to make a covenant explicitly with God, writing down and speaking their acceptance in order that they may return to it in times of doubting. The author patiently removes any obstacles or objections that readers may have about covenanting, showing that it has a clear scriptural warrant. The covenant was to be no mere decision card that was signed off unthinkingly. It was a solemn holy vow before God dealing with our never-dying souls to be taken with due meditation and consideration. Guthrie compares the covenant to marriage vows between the soul and Christ, as a way of formally confessing with the mouth the same covenant that the believer makes in the heart. The following is a helpful summary of The Christian’s Great Interest prepared by William Guthrie himself. The language has been slightly updated for the benefit of understanding. Q. 1. What is the great business a person has to do in this world? A. To make sure of a saving interest in Christ Jesus and to live in a way that is consistent with it. Q. 2. Do all the members of the visible church not have a saving interest in Christ? A. No, in truth only a very few of them have it. Q. 3. How will I know if I have a saving interest in Him? A. Ordinarily, the Lord prepares His own way in the soul by a work of humbling and shows you your sin and misery. He makes you so concerned about it that you long for Christ Jesus, the physician. Q. 4. How will I know if I have got a true sight of my sin and misery? A. A true sight of sin makes a person take salvation to heart above anything in this world. It makes them reject all relief in themselves, seen in their best things. It makes Christ who is the Redeemer, very precious to the soul. It makes a person afraid to sin afterward and makes them content to be saved on any terms that God pleases. Q. 5. By what other ways may I discern a saving interest in Him? A. By the heart going out seriously and affectionately towards Him as He is held out in the gospel. This is faith or believing. Q. 6. How will I know if my heart goes out after Him aright, and that my faith is true saving faith? A. Where the heart goes out aright after Him in true and saving faith, the soul is pleased with Christ alone above all things, and is satisfied with Him in all Him three offices, to rule and instruct as well as to save; and is content to cleave to Him, whatever difficulties may follow. Q. 7. What other marks of a saving interest in Christ can you give me? A. Those who are in Christ savingly are new creatures. They are graciously changed and renewed in some measure in the whole man, and in all their ways are pointing towards all the known commands of God. Q. 8. What if I find sin now and then prevailing over me? A. Although every sin deserves everlasting vengeance, yet, if you are afflicted for your failings and confess them with shame of face to God, honestly resolving to strive against them from now on, and seek pardon from Christ, you will obtain mercy and your interest stands sure. Q. 9. What will the person do who cannot lay claim to Christ Jesus or any of those marks spoken of? A. Let them not rest until they make sure of a saving interest in Christ. Q. 10. How can someone make sure of an interest in Christ if they never had a saving interest in Him before? A. He must take his sins to heart and the great danger into which they have brought him. He must take to heart God’s offer of pardon and peace through Christ Jesus and heartily accept God’s offer by retaking himself to Christ, the blessed refuge. Q. 11. What if my sins are especially heinous and worse than the ordinary? A. Whatever your sins may be, if you will close with Christ Jesus by faith, you will never enter into condemnation. Q. 12. Is faith in Christ only required of men? A. Faith is the only condition on which God offers peace and pardon to men, but be assured, faith, if it is true and saving, will not be alone in the soul but will be attended with true repentance, and a thankful pursuit of conformity to God’s image. Q. 13 How will I be sure that my heart does accept God’s offer and Christ Jesus? A. Go and make a covenant explicitly and speak it all by word to God. Q. 14 How will I do that? A. Set apart some portion of time, and, having considered your own lost condition, and the remedy offered by Christ Jesus, work up your heart to be pleased and close with that offer and say to God expressly that you accept that offer and for Him to be your God in Christ. Give yourself up to Him to be saved in His way, without reservation or exception in any way and that from now on you will wait for salvation in the way that He has appointed. Q. 15 What if I break with God afterward? A. You must resolve in His strength not to break, and watch over your own ways, and put your heart in His hand to keep it and if you break, you must confess it to God, and judge yourself for it, and flee to the Advocate for pardon, and resolve to do so no more. You must do this as often as you fail. Q. 16 How will I come to full assurance of my interest in Christ, so that it may be beyond question? A. Learn to lay your weight on the blood of Christ, and study purity and holiness in all kinds of conduct. Pray for the witness of God’s Spirit to join with the blood and the water. His testimony added to these will establish you in the faith of an interest in Christ. Q. 17. What is the consequence of such closing with God in Christ by heart and mouth? A. Union and communion with God, every good here and His blessed fellowship in heaven forever afterward. Q. 18. What if I slight all these things and do not lay them to heart to put them in practice? A. The Lord comes with His angels, in flaming fire, to render vengeance to them who do not obey His gospel. Your judgment will be greater than that of Sodom and Gomorrah and so much the greater that you have read this book, for it will be a witness against you in that day. Thomas Chalmers gave a good summary of the book in his commendation. 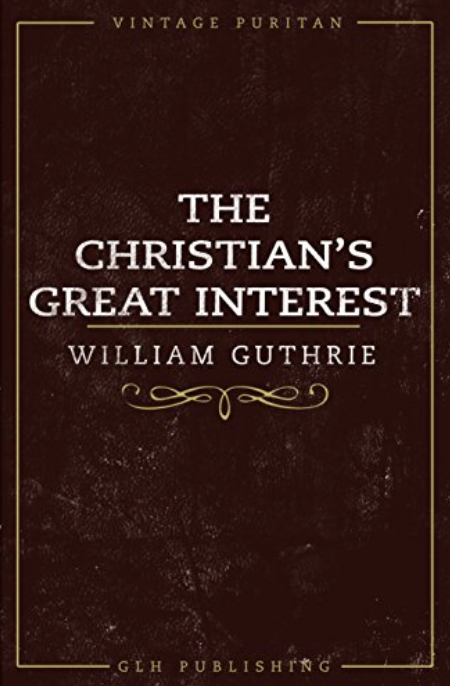 He spoke of Guthrie’s “intimate acquaintance…with the spiritual life, and his clear, affectionate, and earnest expositions of the peculiar doctrines of the gospel”. It is also full of “powerful and urgent appeals to the conscience” that awaken concern about this matter of “infinite importance”. It seeks to avoid the possibility of the reader continuing to deceive themselves while constraining them to seek after full assurance. Guthrie himself closes this plain yet deep and short but full little book with a sublime crescendo.